It’s no secret that plenty of fake identification is floating around. It’s not just youngsters using it to get into bars and clubs, though. That’s actually the fairly innocent tip of the iceberg. Fake ID can be used to obtain benefits, for illegal immigrants to function in society, to obtain jobs and all the other things we take for granted. Counterfeit identification and documents are a massive business, one that functions underground and makes a lot of money for some criminals. When looking for fake ID and fake ID cards, the first question is what’s accepted as ID? Naturally, a valid, signed passport is best, but a UK photo driving license or a Proof of Age Standards Scheme, known as PASS, with the proper hologram are also perfectly acceptable. However, student IDs and armed forces IDs, even with pictures, don’t qualify as acceptable ID, and nor do birth certificates. The simple fact is that’s not too difficult to obtain fairly convincing fake ID. A fake driving license, counterfeit passport, even bills and bank statements with a false name and address to establish residency can be bought. All you have to do is ask around the right people and have the money to spend. The documents they offer are high quality, often generally indistinguishable from the originals. For a while companies online were offering “novelty” fake IDs for as low as £10 – all you had to do was fill out an online form, giving whatever age you wanted, and send a passport photo. In return you received the fake ID, which was often used by underage teens to buy alcohol and cigarettes. 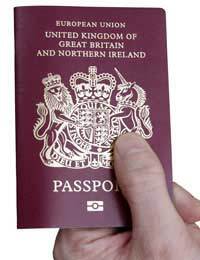 The government insists that its new biometric passports can’t be faked. That’s probably true for passing through borders. But banks, shops and other businesses don’t posses passport readers to let them understand the chip in the passport, making them perfectly liable to faking, and a good faked passport will stand most tests – especially as most people never look at them that closely. As long as the photo looks reasonably like the person (we all know just how bad passport photos can be), it’s signed, and the date of birth looks approximately right, the passport will be accepted as identification, whether counterfeit or not. On the upside, passports are expensive and difficult to forge, meaning that the incidence of them as fake IDs is relatively low. A driving license, however, is a different beast. Although fake driving licenses do abound, the simple use of an ultraviolet light can generally detect the real ones, as they show the marks, such as watermarks, that aren’t visible to the naked eye, but characterize the real ones and show up fake IDs. The counterfeits won’t generally go to those lengths. With PASS cards, a generally accepted form of ID, the fakes are usually quite easy to spot, as they won’t generally sport the distinctive PASS hologram, which is difficult to counterfeit. By limiting the amount of accepted ID, businesses and services are both helping and hindering counterfeiters. It means they can focus on producing better fake ID cards within the acceptable range. However, since the real things have become more difficult to fake, it does also make life easier for the business involved. Of course, most other countries in Europe have national ID cards, which are perfectly acceptable as ID there. By not taking them as legal ID here – people have to produce passports instead – it eliminates the possibility of fake ID cards. If Britain does ever go for national ID cards, then the probability of fake IDs will greatly increase again. Passports have UV markings too.